OMG Life’s new life-logging Autographer camera promises to make capturing those candid moments a virtually effortless task by snapping away continuously as you go about your life. With wearable technology like Google Glass coming to the fore, its timing could be just about right. To address it by its correct term, life-logging is a fairly new phenomenon, at least in any practical way. It usually involves some sort of wearable technology that tracks and captures your daily life – in this case, in picture form. 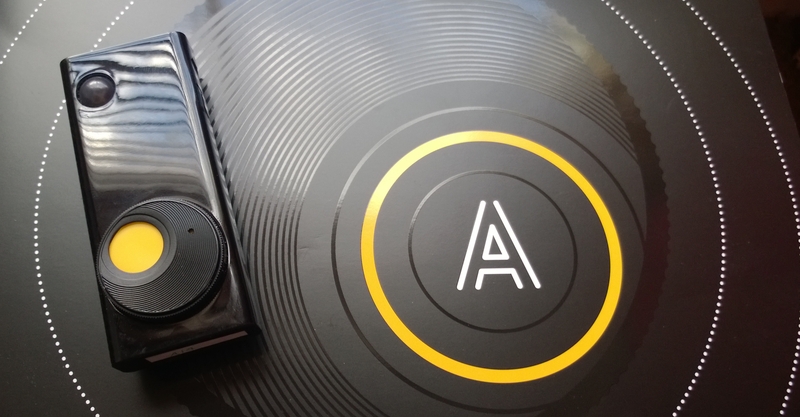 The company behind Autographer — OMG Life — actually set out wanting to create a black box device (as found in planes) for people, which gives you a good idea where it is coming from. We’ve all wished we’d managed to get the camera out of our pocket, or phone unlocked, just a few seconds quicker in the past to capture that fleeting moment. Well, with Autographer, in theory you wouldn’t ever need to think that again. In essence, the £400 ($615) device works by clipping onto a belt, bag strap, shirt or anywhere else you can get it to stay (there’s also a lanyard provided in the box). You then switch it on, selecting low, medium or high intervals of picture snapping (with high obviously resulting in far more photos than low). While it’s only available in the UK and some European countries for now a wider release is expected to follow. 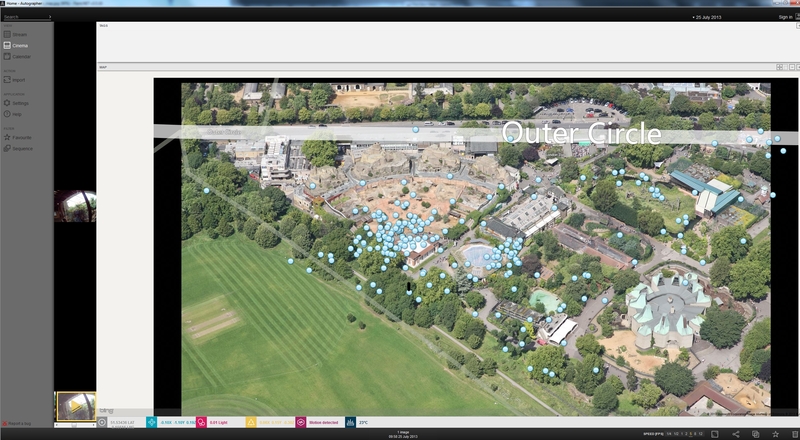 To celebrate the launch and show off the capabilities of the camera, Autogapher took The Next Web along to London Zoo for a couple of hours. The unit itself is about the length of a packet of cigarettes and about half as wide, so certainly pocketable enough and has kept the on-device controls to a minimum: there are just two buttons (one to scroll through options and one to select) and a very simple display. All you need to do to get up and running is switch the device on and open the lens cover. TNW was told that on-board storage will run to about 28,000 photos (8GB of storage) and battery life is about 10 hours on medium capture rate, meaning that you’ll run out of battery long before you run out of space. It then combines all this information with its algorithm to decide when to take a picture. 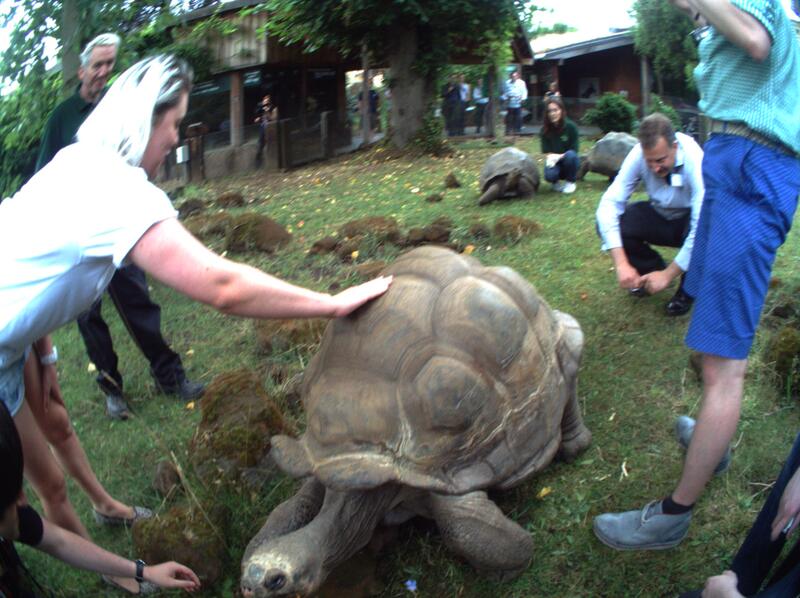 Clipping the camera on — I popped it, as recommended, on the neck of my t-shirt — we were led to the giant tortoise enclosure (before you ask, they don’t know how old but think he’s about 70). After being advised not to let our fingers get too close to his mouth while feeding him, we were let loose. Now, you might be thinking that’s a bit of a blurry picture, and you’d be right. The Autographer has a 5-megapixel camera with a 136-degree field of view which gives every picture a slight fish-eye effect. The Autographer is also slightly different to a normal camera in that, while most cameras are optimized for taking their best pics when stationary, this little unit has to be able to keep churning them out while in continuous motion. Bearing this in mind, the shots aren’t too bad, but I wouldn’t be too upset if the picture above didn’t exist. That’s not to say you can’t take a crisp shot with the Autographer, just that if you do it’ll be down to luck rather than anything you did. For example, a snap taken a few seconds before (below) is much crisper, but then my knee and arms are in the way. Again, I wouldn’t be too gutted to not have captured a close up of my hairy arm. We hadn’t even made it to the gorilla enclosure yet. 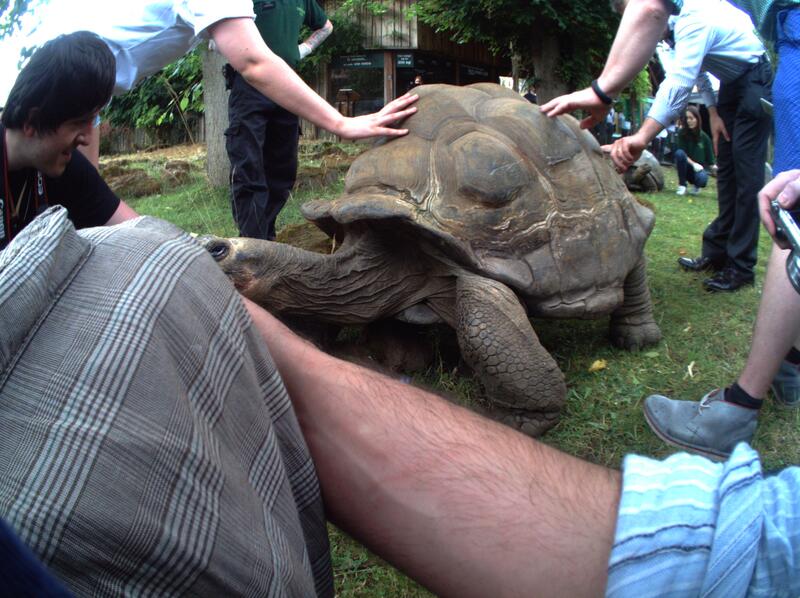 This is a situation I saw repeated hundreds of times over during my time with the Autographer. Either the shots were borderline terrible quality, or were passably fine but otherwise ruined by someone or something blocking the picture. With few options on the unit, there’s not really a lot to mess about with and there’s no screen, so there’s no way of finding out whether you’re capturing gold or trash either. There is an iOS app that accompanies the device which connects to your phone via Bluetooth, but I couldn’t find a way to continue shooting while it was connected to a phone. So, while you can stop taking pictures to connect it up and have a quick glance at the images, if you do so you run the risk of missing that shot that you really turned it on for. Check out the promotional video below for an overview of the app. During the morning, set on high capture, the camera took several hundred pictures – of which I’d think I’d probably like to keep about 5 – 10, which isn’t the best hit rate. Reviewing the hundreds of pictures also isn’t as easy as it should be when you do finally get the unit back to a computer and plugged in to transfer the images. The actual import process is incredibly easy, just plug it in and hit import – it won’t double up on previously imported pictures, giving you the option to leave the snaps on the device post-import or to clear it ready for its next outing – but what you are met with is row after row of untagged images. Obviously tagging is the intended option, but with several hundred virtually worthless pictures I didn’t see the point. Reviewing the ones you want to see in a slideshow (which can also be compiled into a ‘Movie’ in up to 1080p with a music track) is also possible, but to do so you’ll need to manually select each and every picture you want included in it – there’s no batch select option or support. However, the software does have a feature I really like, which thanks to its GPS sensor, tracks and maps where every picture was taken. This is incredibly useful, particularly given the slightly lacking sorting options, as it’s far easier to remember where a picture was taken or what you were doing than exactly when it was taken. It’s particularly useful in a place like London Zoo which Google Maps already has covered in incredible detail. Each of those dots represents a picture that was taken, zooming in shows even more of them and allows you to click on individual markers to jump to that photo. I was so disillusioned as to the overall quality of the images that came out of the Autographer that when I traveled the length of the country from London to Northumberland for a family birthday it seemed like the ideal opportunity to test it out again. However, we may well have been blessed with beautiful weather but we weren’t blessed with beautiful images. And once again, of the 800 or so images that were taken over the course of a few hours here and there, only 10 -20 are keepers. While Autographer’s execution isn’t perfect at this stage, it is at least possible for OMG Life to update its firmware and add new options to the desktop client and app. However, for me, I’m not convinced that Autographer is a useful addition to my life as it is: the pictures are almost uniformly poor and on the occasions something dramatic did happen (at one point in the zoo a giant gorilla ran past the glass at full speed, banging on it as he went) there was no record of it. Ultimately, at the times where I thought, I really hope it got a snap of that, it hadn’t. 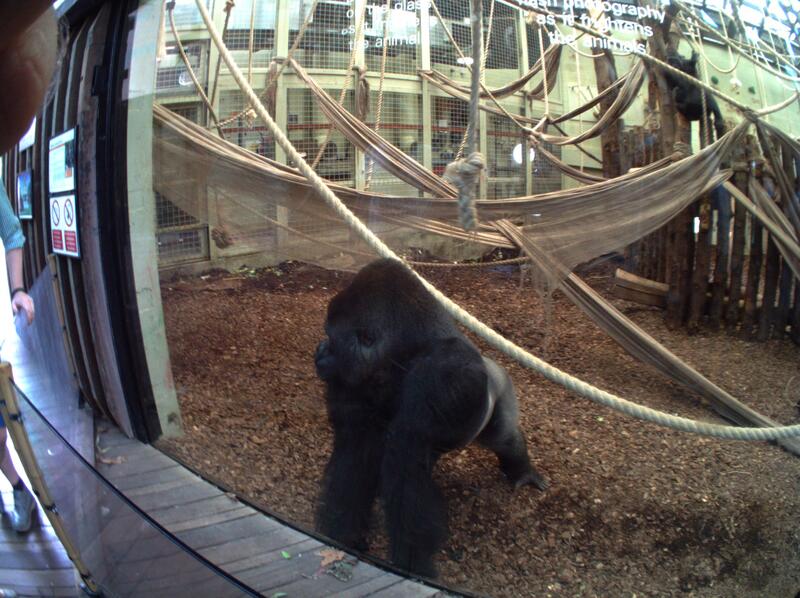 For the record, the gorilla came back and stared unhappily back at us, the Autographer did capture that. The Autographer goes on sale tomorrow from Autographer.com and is priced at just under £400. If you’re keen to get one, they’re going on sale to customers in the UK, Germany, France, Spain, Italy, Belgium, Luxembourg, the Netherlands, the Republic of Ireland, Portugal, Austria, Bulgaria, Cyprus, Czech Republic, Denmark, Estonia, Finland, Greece, Hungary, Latvia, Lithuania, Malta, Poland, Romania, Slovakia, Slovenia and Sweden. A wider global release “will follow soon after”, OMG Life said. 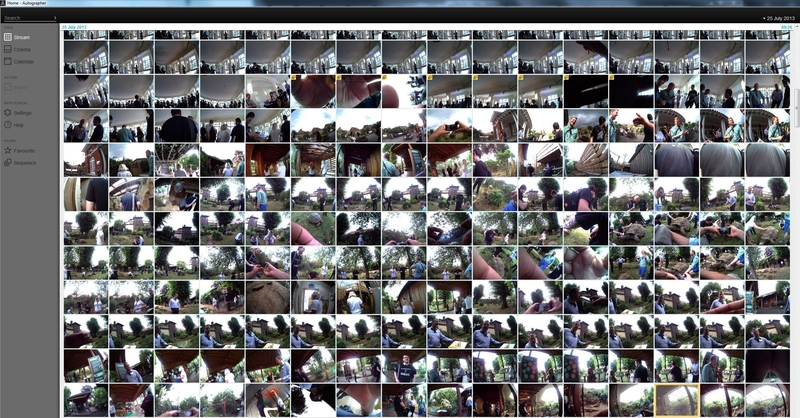 While the Autographer is great at producing a timeline of snaps, it’s not good at producing a timeline of worthy ones. One thing that worked exactly as intended, however, was that I totally forgot about it once it was switched on. On the downside, it also meant that I ended up with 300 or so (not included in my previous picture totals from each day) completely black images where I had closed the lens cover for some reason (going to the bathroom, for example) but forgotten to open it up again. As a device for tracking where you’ve been and what you saw (generally) the Autographer performs well, but as a device capable of capturing those candid one-off moments it does considerably less well. I’m mostly on board with the general idea (although the nefarious uses for a camera that just silently snaps away as you walk around are obvious) and it can be of particular use if you often find yourself struggling to find that one snap in your collection, but you know exactly where it was taken, but the execution on the Autographer just isn’t there yet. I’m also not a fan of having all of my pictures fish-eyed in style. Perhaps future updates will improve the algorithm used to take the pictures and the performance of taking pictures while in motion but as it stands today, I’d be pretty disappointed if I’d just shelled out £400 for an Autographer.